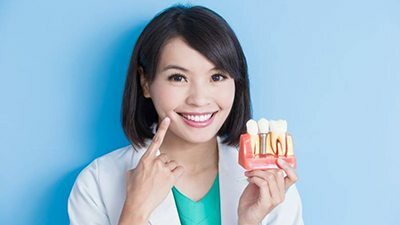 If you’re missing natural teeth, much more than just your oral health can be negatively affected – your self-esteem, biting strength, and quality of day-to-day life may take a steep dive as well. At 21st Century Dental, we offer a state-of-the-art solution that will virtually turn back the clock on what’s been lost: dental implants. Our dentists can replenish your smile with new “teeth” that look, feel, and function just like the genuine article from every possible angle. To see if you’re a good dental implant candidate, contact our Las Colinas, TX practice for a consultation today. Why Choose 21st Century Dental for Dental Implants? Dental implants are biocompatible metal anchors that are surgically positioned in the jaw beneath the gums to support an artificial crown where natural teeth are missing. Implants are never cemented or connected to remaining teeth the way traditional crowns or dental bridges are. 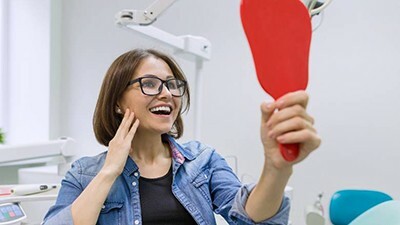 As a tooth restoration, implants are comprised of two parts: the implant, which is usually made from a metal called titanium that is readily accepted by the body (it’s the same thing that’s used in hip and knee replacements). The second part is a porcelain crown that is fabricated in a dental lab and made to look exactly like a natural tooth crown. Alternatively, your implant dentist in Las Colinas can attach a bridge, a partial or a full denture to dental implants. Accepted by the American Dental Association, dental implants have been used for many years and hundreds of thousands of them have been placed successfully. How does an implant stay firmly anchored? There is a phenomenon called osseointegration, meaning that titanium is so compatible that bone actually attaches itself to the implant. 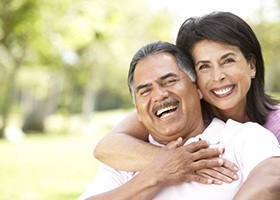 The advantages include increased stability of dentures while also reducing long-term bone resorption and the ability to restore a missing tooth without altering the teeth on either side of the space. We won’t sugarcoat it – dental implants are a significant investment of time and money. While our team believes that the end will more than justify the means, resulting in beautiful, functional, and long-lasting teeth that will stand the test of time, we understand that patients may be hesitant to pursue treatment because of the expenses involved. 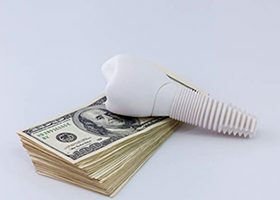 At 21st Century Dental, our knowledgeable and compassionate team knows a thing or two about making dental implants affordable for a wide variety of budgets. 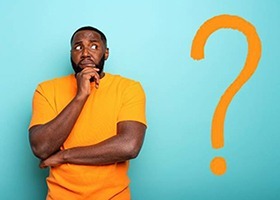 We will walk you through your options, explain everything in concise terms, and help you create a customized financial plan that leaves you smiling. Anyone who is missing teeth and can benefit from better chewing efficiency, as well as improved appearance or speech, is a candidate for implants. Implants can be the solution when it has become difficult or impossible to wear a removable partial or complete denture. For patients at a high risk for decay, implants are a great option too because bacterial decay will no longer be a risk factor with implants. You have enough jaw bone and bone density to secure the implants. Our team can anchor a single dental implant in place within the jaw to replenish one tooth at a time. We will design a beautiful, all-porcelain dental crown that fits over the implant without threatening the health of natural teeth on either side. We know our patients will be amazed by how seamless the final result is – implant-retained single teeth are an ideal match for the rest of your smile in terms of appearance, function, and durability. Have you lost multiple teeth that used to appear next to one another? 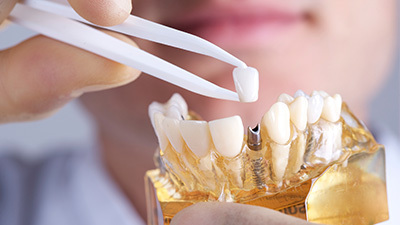 Traditionally, dental bridges were the best method for replacing this needed structure, but the technique of filing down natural teeth to accommodate new crowns is a technique that can actively harm your continuing oral health. Instead, our dentists strongly recommend implant-retained dental bridges, which are attached to dental implants anchored into the jawbone for support. The final result looks better, feels better, and is a big improvement for your wellbeing too. Many people believe that dental implants can’t be used to replace several teeth at once – but this isn’t true! Implant-retained dentures can be anchored in place over a small number of strategically placed implants, which makes them more cost-effective than if our dentists were to match each implant to its own individual restoration. Do you want new, permanent teeth that are fixed in place? Are you used to traditional dentures and would prefer to be able to remove your prosthetic? Both options are available here in Las Colinas. 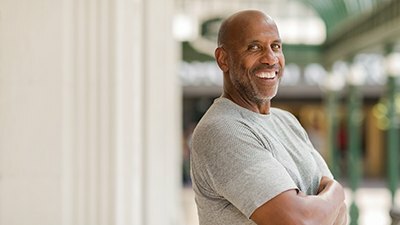 Like the name implies, this state-of-the-art reconstructive technique involves replacing an ENTIRE arch of teeth with just four little implants. Each implant will be angled in just the right position to provide optimal support to the custom-made full denture. Better yet, our dentists can plan to place your brand-new “teeth” immediately after the implants are surgically positioned. There’s no waiting! After a few weeks of wearing a temporary All on 4 denture, patients will need to return to the practice for their permanent prosthetic. First, an examination and medical history are conducted with one of our dentists. Your exam may include several types of X-rays to provide essential information about your jawbone and its anatomy, as well as models of your jaws. 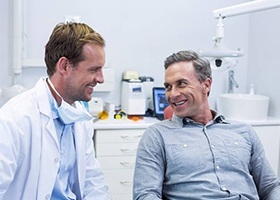 If we determine that you are a candidate, then we will connect you with one of our implant surgeons: Dr. Jeff Roy, Dr. Ashley Bristow, or Dr. Andrew Barnett. Based on the results of each of our examinations, the team will discuss all aspects of your case with you, and Dr. Roy or Dr. Bristow will design the final restoration that sits atop the implant. 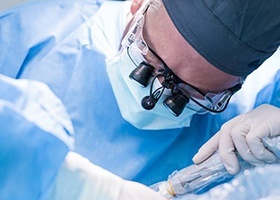 Stage I Surgery : Most likely done in a dental office setting, the first procedure involves placing the implant fixtures in the jaw bone under local anesthesia and a mild sedative – or in some cases, IV sedation or general anesthesia will be used (this depends on where your desires weigh heavily). The integration to bone will take place as healing progresses, so the implant fixtures should be firmly anchored to bone within three to six months. Some cases will require bone grafting to ensure that the implant anchor is completely secured in bone. Stage II Surgery : This only occurs in rare cases. The second stage surgery is completed under local anesthesia or sedation if you desire. The implants under the gums are exposed by the surgeon, so within 3 weeks, the restorative dentists can place a crown on them. This is minor surgery if necessary at all. Immediate Implant and Crown Surgery : In rare cases, the situation may be conducive to receiving your implant and temporary crown on the same day. Again, some of these cases will need some bone grafting for optimal success.